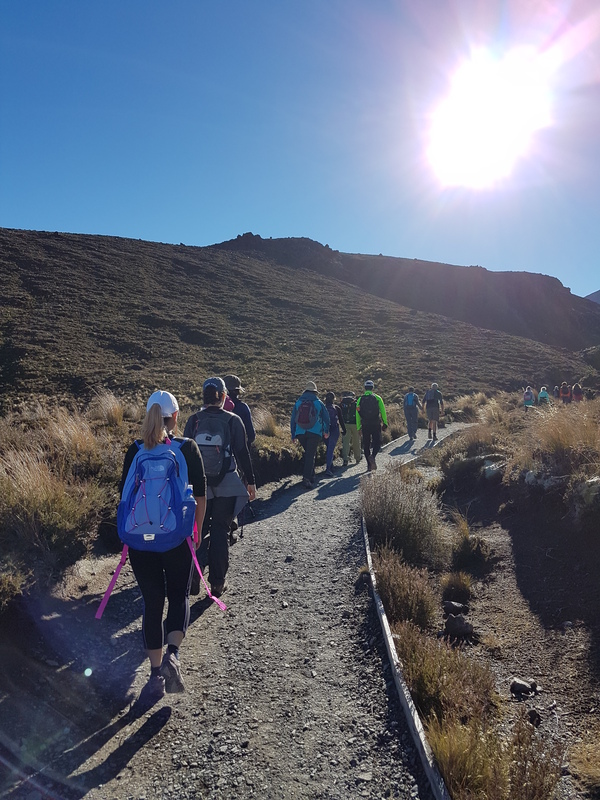 I have decided to break down my Tongariro Crossing post so that I can get into more detail without making things too long and too dragging. There’s a total of six parts coming up, each post discussing one major section of the hiking track. First up is Mangatepopo Carpark to Soda Springs. 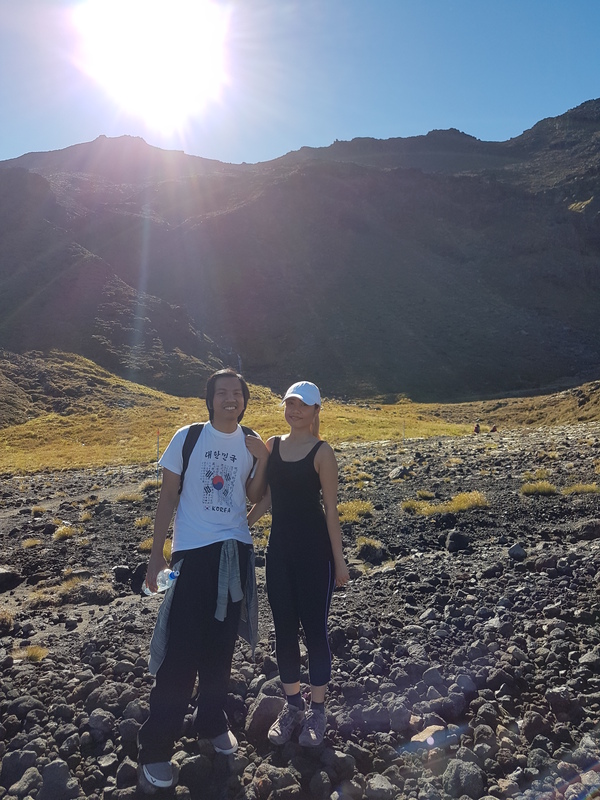 We woke up early Saturday morning and drove from our motel in Taupo to Mangatepopo carpark, which was the end point of the hike — ( took about an hour ). We were to be picked up by a shuttle, which we organized beforehand, to bring us from the end point all the way to the start of the trail. We arrived at about 0700 and were supposed to be picked up by 0720 but due to some mix up with our shuttle company, it wasn’t until around 0820 when we actually went on our merry way. We “officially” started our walk at around 0900. We were lucky that the weather turned out to be really good during our trip — it was all gloomy and wet days prior to this, and back to raining quite heavily again now as I am writing this post. With the sun shining high in the sky that day it wasn’t long before all the layers at the start of the walk (see first photo above of us wearing our puffer jackets) got shed off one by one… Down to a thermal on the above photo and then down further to my tank top on the photo below in just a few minutes. Haha. The first part of the trek was fairly easy — mostly flat ground with proper walkways and some walking boards over the damp areas. This was the least challenging and tiring out of all the sections (Average time to complete it is about 1-1.5 hours ). If you do the hike in the future, savor your time here… things will only get harder, I tell you. Haha. By the time we arrived at Soda Springs, we were still feeling pumped and full energy. From the main track, Soda Springs Falls can be seen. We initially debated whether we do the side track going to it or just carry on to the next section of the track. As it was only 10 minutes away from where we were, we decided to just explore the waterfall area anyway. There was no proper pathway going to the falls and the ground got more wet, and muddy the nearer we got and we had to climb up onto rocks as well. Three in our group, who were just wearing normal sneakers, decided to stop at a certain distance while two of us who were wearing hiking shoes were able to to go all the way. After some photos, we then went back to the main track where we had a quick water and toilet break — Just a bit further along was the last set of toilets which we would come across in the next few hours so we thought we’d make use of it. 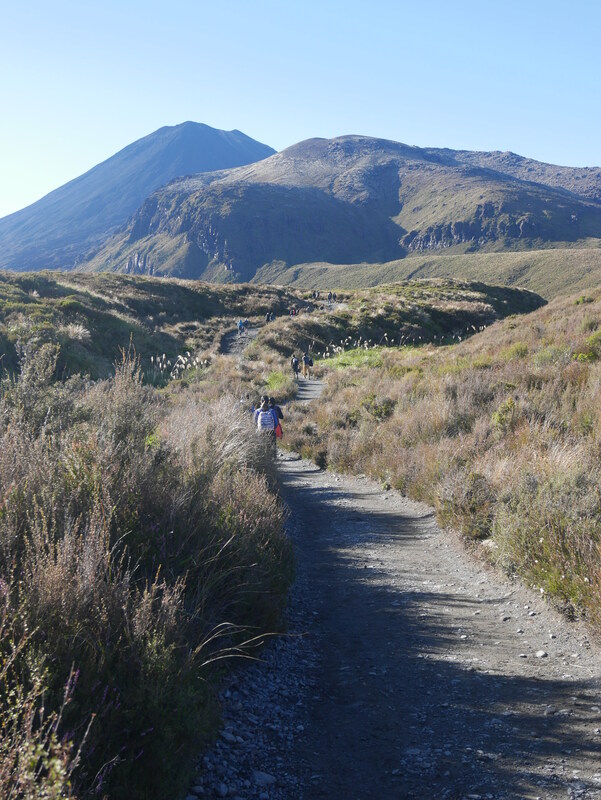 After that… we then went on to the next section: Soda Springs to the South Crater, where the infamous Devil’s Staircase was awaiting us.